TheAtlantic.com | Web 2.Oh. . .really? The Atlantic.com, web outpost for the improbably long-tenured U.S. magazine, has debuted another iteration. I’ve lost count of how many sub-launches of the site there have been just since I’ve been paying attention. But that’s good. From where I sit, multiple iterations are the way to progress on the web. Too often web developers sit for months creating a grand castle, worrying the details until it’s just “right.” But time passes, opinions multiply, and eventually the grand castle is released as a McMansion with a scrim of Google ads running down the side. Three years later, another team is back at it, with pictures of a new castle up on the conference room walls. Theatlantic.com, by contrast, just keeps pushing out upgrades every few months. Each one gets better, and creates subsequent opportunities to correct and change course. And here’s editor James Bennet’s explanation of what’s going on. Key detail. A news-ish feature called “The Current” has been renamed “Dispatches.” Good move. “Dispatches” I understand. “The Current”. . .not so much. More proof that on the web, clear beats clever every time. FOUR FREAKIN’ PROMPTS TO SUBSCRIBE TO THE PRINTED MAGAZINE, ABOVE THE FOLD, OCCUPYING THE MOST VALUABLE REAL ESTATE ON THE WEBSITE. Stop that, I tell you, stop that! Last week I introduced a new feature, the Web 2.Oh. . .Really? Print ‘n’ Read (sm). Each week I highlight one piece of journalism so worthy of extended attention that it’s actually worth printing out and reading later on, away from the computer. This selection is either incredibly on-point or ironic, depending on the state of your particular neural network. Carr’s story offers the rather obvious conclusions that: (1) adult brains can be remapped through repeated activity; and (2) this includes activities like the constant click-and-dive of typical web use. Ergo: Web use makes our brains more acclimated to skimming wide rather than reading deep. Which is to say, printing out and reading this article about the effect of web use on your brain may help preserve your current style of brainwork. My small contribution to the status quo. n.b. Do not miss digital journalism bodhisattva Scott Karp’s response to Carr’s article. Karp’s determined, mapcap journey through the world of analog and digital journalism to track down the magazine, the article, the quote attributed to him, and the proper context for that quote is likely to remap your prefrontal cortex all by itself. I’d tell you to print it out too, but I’m afraid your printer may pull a HAL. A blog entry last week in which I gave positive reviews to The Washington Times’ renovated website provoked a response from a reader whose confession may mark a key moment in newspaper history: A reader who canceled a subscription to the print edition because she thinks the website stinks. The Washington Times redesign is a disaster. We actually cancelled our subscription over it. . .
Who says newspaper advertising is dead? Atlantic.com: They Get It, They Really Get It! The Atlantic, the magazine that is rarely described without the adjective “venerable,” has undergone an astonishing web rebirth–or, rather, series of rebirths. I don’t mean they’ve gone on the web. They did that a long time ago. I mean they’ve gotten the web. The magazine (which, with its we’re-doing-it-meta-so-we’re-not-really-pandering cover story on Britney Spears is perhaps trying to earn the adjective “venereal”) has updated is website three times in the past year. Each time it’s gotten better–more web-savvy, more accessible and less self-infatuated. With its first re-do in August 2007 (for which I gave it this fanny-slam), it retained its dead-from-the-neck-up policy of asking readers to pay to read the full text of the best articles that appeared in the magazine. It also pretty much kept readers out of the game entirely, sticking with the other dead-from-the-neck-up policy of pushing material to web readers but hardly letting them talk back. Smug. A few months ago the Atlantic website was re-iterated, guillotining the pay-to-play policy and letting readers romp a bit–adding a not-very-venerably-named “Hot Reads” box of most read, commented, etc., splaying out an excess of thinky blogs on the home page, and opening up to reader comments. I could pick nits, but won’t. The Atlantic has demonstrated one of the most important concepts of web development–repeated iteration and continuous improvement. I suspect more improvements will come, but already the website has cleared a very high bar. I’m delighted to report that as of today the website for The Atlantic magazine has stuck an epee in its self-infatuated, self-destructive policy of permitting only subscribers of the print edition to read articles published in the printed magazine online. A New York Times story reports on the change of heart. The Atlantic’s policy, while not entirely uncommon, is so dunderheaded it’s hard to know where to start. People who subscribe to the print edition don’t need to read the stories online–so they essentially receive nothing of value for their patronage. Potential new readers are punished and insulted when they go to read an article and get stopped by the dead-tree police. Subscribe or pay $2.95 to read any further, pal. You got a problem with that? This kind of policy begins when someone in a corner office sputters, “But we can’t give it away for free, we’ll erode our subscriber base!” and turns into reality when others in the room lacking the courage or brains to explain why this is a terrible way to treat high quality content these days. Atlantic’s operators got religion when they realized, hey, the site’s excellent blogs were getting enough traffic to sell–they’ve even hired some people to sell ads for it now! Go to theatlantic.com and you can–if you’re feeling like a chair in front of a computer is a good way to spend the next 45 minutes or so of your life–read every freaking word of Jeffrey Goldberg’s excellent piece on the Middle East after Iraq. Or the usually brilliant Dana Milbank’s not-all-that-funny excerpt of his new book about lifeways along the Potomac. 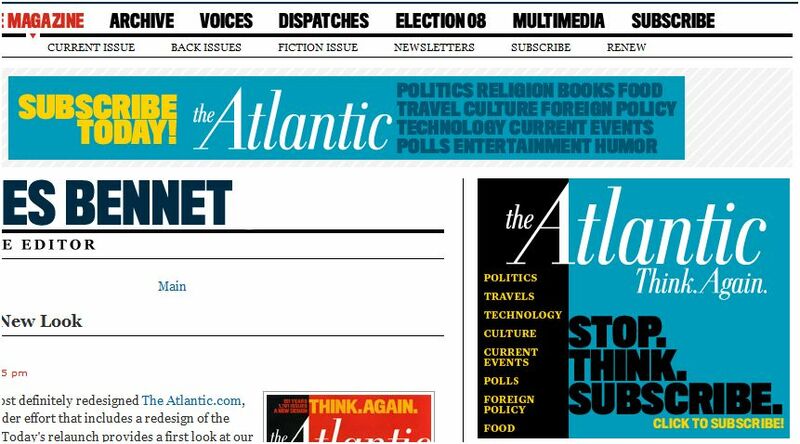 The last time I looked at Atlantic’s site, I cited them for highbrow contempt of reader–not even having the decency to publish a most read/most e-mailed listing to allow their readers to have some sort of say in what appears on the site. There is now a lipstick red box that squeals “Hot Reads” and includes most popular items from the magazine and online, and the items with the most comments. Good move, but now they’re trying too hard to be with the smart set: Lookit, kids, I get it now! The Atlantic, that long-tenured magazine for the thinky set, has updated its Web site. It’s one of the better recent magazine site re-dos I’ve seen. It suffers some surprisingly obvious usability issues, but overall it’s a smart renovation of a smart publication. Fundamentally, theAtlantic.com renews the online experience for the emerging bigbrain reader, adding blogs and reader comments yet managing to maintain (even upgrade) the magazine’s tone and intellectual integrity. While it’s extremely dynamic (largely via high-IQ bloggery, which the authors seem to be cranking out by the hour! ), the site resists the faddish lurching you see on so many 2.0-era updates. Its prudery about 2.0, however, exposes a serious character flaw. More on this below. The new home page is topped with a visual five-tab module that presents dynamic ledes in (I think) 6-second rotation. I didn’t expect visuals as the main entry point for the known-for-its-prose Atlantic. But it’s great: Each image drives readers to one of the current issue’s key articles. The images are strong and interpretive (with one odd exception–what’s with that my-senior-in-art-class-kid-could-do-that illo of Ira Glass?). The new site’s above the fold anchor mixes highbrow eye candy with substantial content. But a key flaw here begins to expose the site’s weakness: Those features are sometimes free and sometimes three-graf teasers to stories whose remaindeer is available only to subscribers or other cash customers. It’s hard to describe the feeling this generates–I’d say it’s somewhere between “contempt” and “apoplexy.” Atlantic: I know you need some way to pay the bills. Coercing me to put up cash after hooking me with high-quality content is manipulative, small, even mean. New Tobias Wolff fiction? Read two grafs, then cough up $2.95 to finish. One wishes for an extended-middle-finger emoticon. Below, the site is organized into three vertical columns, badly labeled: “This Just In”, “Featured” and “Atlantic Voices”. Since the Voices are usually the authors of This Just In, the two offerings immediately baffle. Look, Andrew Sullivan on the left, under This Just In! But look, Andrew on the right, under Voices, with an entry that’s newer than the one in This Just In! Gentlemen, synchronize your watches. Or something. The middle column should be titled “From our Latest Issue” or some such. Otherwise, a reader of good faith is left to wonder how those “features” are different from the five features rotating above in the visual module overhead, some of which are indeed duplicates. The centr ring at this point seems to be “stuff we want you to see, most of which is from our most recent issue, and some of which promotes our franchises, like the fiction issue.” That column needs a strategy–or a new name. That middleware also includes “Editor’s Picks.” This represents a bad decision, made obvious throughout the site, to limit user’s participation to comments-only. Yes, theAtlantic.com is a mashup-free zone. I, for one, would actually want to know what Atlantic online readers are viewing the most, e-mailing the most, commenting on the most. I certainly want to know those things from Atlanticians more than from those chin-drizzles over at Digg. But theAtlantic.com doesn’t let readers play. There’s something smug and disrespectful about this–this containment policy of reader involvement—that’s inappropriate for a publication with such a smart and engaged group of readers. The Atlantic seems to be underestimating its own audience. That rarely ends well. As James Bennet’s editor’s note explains, theAtlantic.com is a work in progress. Good. At this point it’s done a very good job looking inward and finding sharp ways to adapt to a changing media environment and reader. But they haven’t looked outward, even at their own readers. To paraphrase a politician who has been the subject of many Atlantic articles over the years: It’s time to ask not what you can do for your readers, but what your readers can for you.